Who’s Allowed to be Innovative Anyway? In a recent conversation about innovation and education reform, the argument was put forward that graduate teachers should not be expected to be ‘moonshot thinkers’. That is, thinkers who are pushing for the supposed impossible. The point was that if everyone had their heads in the clouds dreaming of a completely different answer, who is on the ground working for today. In addition to that, graduates must be allowed a certain amount of time to get their bearings before being asked to be innovative. I was left with the question, who should be innovative and is there an opportunity missed in encouraging graduates from the start? When I teach essays in English, I explain to my students that guides and strategies, such as TEEL, are not a rule, but rather a starting point. That instead of memorizing a structure, they needed to understand that all writing is structured for a reason, but ideally they needed to find their own structure associated with their intended purpose. Something that Austin Kleon explains when talking about voice, “The only way to find your voice is to use it. It’s hardwired, built into you.” I think that innovation is much the same. I have seen too many graduates been spoon fed in their first few years only to then falter when the additional support disappears. The problem that occurs is that all the focus is placed on the what, with little guidance on the why or the how. My concern is that after their first few years, too many become indoctrinated and believe that the power of change rests with somebody else. Sadly, when I reflect on my experiences, I feel that I spent too many years in other people’s shadows believing that they would drive the change that I saw was needed. I think that where this change needs to occur is with the whole program of graduate accreditation. In Victoria, graduates are asked to develop a portfolio in order to become provisionally registered. Too often this is seen as a tick box activity where the predominant question asked is what do I need to do, rather than why and how will it benefit me and my students. I was lucky enough last year to mentor a music teacher enrolled in an accelerated learning program where he was supported both in and out of school. For his registration process the university required him to complete an action-based research project. Although this seemed somewhat more rigid than the usual accreditation process, from my perspective it was much more meaningful. Instead of capturing an example of learning and teaching as most often do, he focused on assessment and reporting. Across the year I watched his practise move from being teacher centred to allowing students more flexibility as to how they chose to learn. This included a move to make music more hands on, as well as a move to involve more play and experimentation. I felt the true success was that it led me making certain adjustments to my own practise and pedagogy. I understand that there may be a question of workload and a push to increase teacher retention rates. However, How does spoon feeding graduate teachers help? Couldn’t the extra time and support be used to really kick start pedagogical innovation from the start? Just wondering. Who’s Allowed to be Innovative Anyway? by Aaron Davis is licensed under a Creative Commons Attribution-ShareAlike 4.0 International License. My heart skipped a beat Aaron when I saw what you had written … “too many become indoctrinated and believe that the power of change rests with somebody else.” That is the end result of decades institutionalised learning. It still is driving education, but it is fraying around the edges and cracking here and there as more and more educators all over the globe are realising what you have just acknowledged. Institutionalised learning tells us how to think, how to learn. Sure we can roam a bit, but basically, don’t go too far; don’t change too much. If you question this then just try to de-emphasise numeracy and literacy to the same importance as creativity, ability to collaborate or give and receive feedback, to innovate. All of these things are talked about as being important, but a school is judged as being high or low performing based upon its NAPLAN results, and some other measures, but its efforts at inspiring students to be creative, collaborative etc are barely considered. Thank you so much for your comment Alan. I am not too sure how we change the conditions. Those who have invested in the institutionalisation hold onto it tightly. I agree that it is at the margins where things often happen. I really like your point about stopping innovation. When you put it like this, innovation can be seen as a default setting. Guessing that is probably how it should be. A constant cycle of ideation and prototyping. We are actually right now in a kind of no man’s land, or is it a milling area … not sure. In any case there is the old education culture, still going strong, and the new still finding its way, but knowing the old culture is not the way anymore. The old culture to my mind is like an old fellow who is confident in old ways, suspicious of the young whipper-snapper challenging those ways. The old will give way to the new in the end though. The question each educator must ask themselves is whether they are prepared to be an agent for change or continue supporting the old paradigm until someone else does something. I would have to agree. New teachers are very reliant on those around them particularly with planning. I still remember my first teaching position where I was shown my classroom and told I had grade 3/4 and then left to my own devices. Some would be horrified by this but it was the best thing that ever happened to me. You had to get in and trial approaches and find out the things you didn’t know- on your own! Thank you James for the comment. I think that it is such an interesting topic. 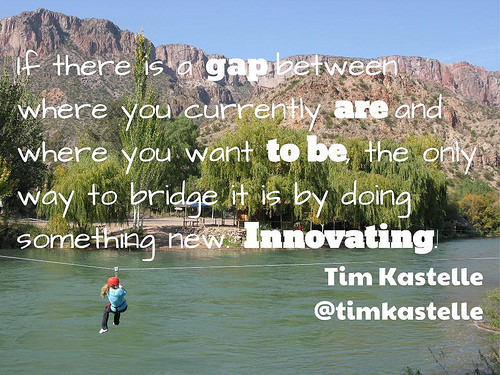 I wonder what impact sink or swim cultures have for innovation and change. I think that the challenge is to foster a culture of collaboration.